Dam Break Flood Studies: Subsequent to the near failure of the emergency overflow spillway at Oroville dam in 2017, the State of California adopted legislation requiring that the owners of moderate to high risk dams submit dam break flood studies identifying the area of inundation downstream of the dam in the event of a breach. Prior to adoption of the new requirements PHI had completed dam break flood studies for several dams in northern California meeting the earlier requirements. Since adoption of the new legislation in 2018, PHI has completed over a half dozen dam break flood studies in northern California meeting the requirements of the State of California Division of Safety of Dams (DSOD). FEMA Flood Studies and Flood Risk Assessment: FEMA discourages development within the Special Flood Hazard Area (SFHA), the floodplain during a 100-year flood event or FEMA “Base Flood”, however it is not always possible to avoid encroachment within the SFHA, especially if constructing new or replacement bridges and often when optimizing the feasibility of residential and commercial development. Replacement bridges encroaching within the SFHA are usually designed to preserve existing flood hydraulic conditions. Projects developed within the SFHA may increase or decrease water surface elevations or the extent of inundation during the FEMA Base Flood. If this is the case for a project within an area having flood risk mapped by FEMA using detailed study methods (Base Flood water surface elevations identified), FEMA requires that their published Flood Insurance Rate Maps (FIRM) be corrected and that any increased risk of damage during the Base Flood be mitigated. Prior to construction FEMA approval of a Conditional Letter of Map Revision (CLOMR) is often required. After construction FEMA approval of a Letter of Map Revision (LOMR) is required. Other less rigorous FEMA applications may be required for projects involving fill in the SHFA and for correcting published FEMA maps based on more precise topographic data. PHI has conducted and reviewed numerous flood studies to identify potential flood impacts associated with new development and to identify mitigation requirements necessary to avoid increases in flood risk. In cases where the new development was located in a FEMA SFHA determined using detailed study methods and the project resulted in a change in the Base Flood water surface elevations or the extent of inundation, PHI has prepared FEMA map revisions. PHI has also prepared FEMA map revisions to correct or update FEMA Flood Insurance Studies (FIS) and FIRMs based on new or improved data and methodologies. Flood studies conducted by PHI for purposes other than FEMA compliance include studies prepared in support of flood, erosion, and sedimentation claims and prepared to meet local agency and common law requirements. Olney Creek has a perched channel as it approaches the Sacramento River. As a condition of development a levee was constructed to separate flood flows in Olney Creek from the left bank floodplain which decreases in elevation in a direction perpendicular to the channel and enters the Sacramento River farther away from the levee. Having inadequate data available to document the sufficiency of the levee to meet the minimum standards of FEMA for protection of structures during the most probable 100-year flood, FEMA de-accredited the levee and published a draft Flood Insurance Rate Map (FIRM) reflecting the interior area inundated to the Base Flood water surface elevations of the stream channel. The draft map included approximately 650 structures many of which were clearly not at risk of damage due to the vast opportunity for overflow to find alternative paths to the Sacramento River. The City of Redding was provided the opportunity to develop their own flood map of the interior area that FEMA would review and rely upon if sufficient. 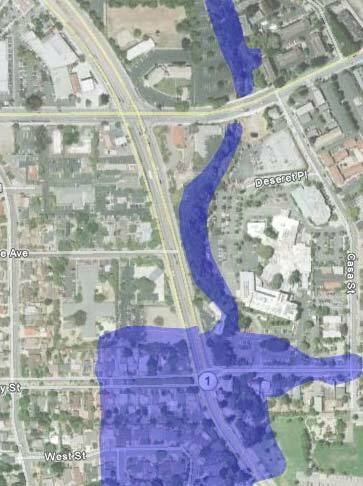 Pacific Hydrologic Incorporated was retained to prepare this flood map early in 2010, well before any public announcement by FEMA of new mapping procedures. Recognizing that the PHI approach to mapping the interior area was not consistent with FEMA standards at the time, given the unique set of conditions at this site PHI chose to estimate flow entering the interior area by a weir equation over a bridge deck (not all flow entering the bridge deck returned to the channel downstream) and a breach equation at the hydraulically highest point along the levee. Within the interior area PHI identified the overflow floodplain using a backwater model and identified the breach floodplain using slope area calculations within road prisms. The interior flooding analysis also considered flow accretion from other sources and recognized the great opportunity for flow to enter the Sacramento River. Breach computations and assumptions were conservative and well documented. The resultant flood map indicated approximately 300 lots potentially affected by the Base Flood event with levee failure, and the structures on many of these lots were outside the flood limits. This study was submitted to FEMA in May 2010 for review with full expectation of comments requiring revision. Instead, the City of Redding received a letter with comments and agreement to accept the interior SFHA identified by PHI as Zone A. This study preceded public announcement of proposed new mapping procedures where the interior mapping would be identified as Zone D but stands as a successful early application of methods considered under the proposed new mapping procedures. During an inspection of a pair of large culverts conveying Stenner Creek under Foothill Boulevard around the year 2000, conditions associated with potential imminent failure were identified. The City of San Luis Obispo closed two lanes of traffic over the high risk portions of the culverts and programmed funds for replacement of the culverts with a bridge. The culverts were known to be inadequate to convey the Base Flood in Stenner Creek and therefore responsible for overflow affecting numerous residential and commercial structures included assisted living facilities. Although the City of San Luis Obispo initially looked at bridge options that preserved flood hydraulic conditions, investment in a new bridge that continued to cause overflow was not considered a socially acceptable approach. Therefore a bridge capable of conveying the Base Flood without causing overflow was selected as the preferred replacement bridge. However, flow that once left the channel as overflow during the Base Flood would be contained in within the channel until reaching the next, even more restrictive bridge. 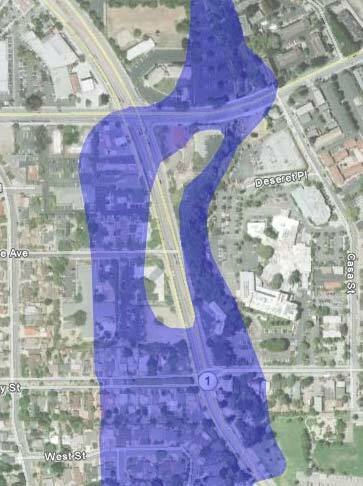 Hence, even though many structures would no longer be inundated by overflow from upstream of Foothill Boulevard, the peak flow of the Base Flood and therefore flood risk along Stenner Creek between Foothill Boulevard and the next bridge downstream would be increased as a result of constructing the preferred replacement bridge. Prior to constructing the preferred bridge PHI prepared a CLOMR application for the City of San Luis Obispo to submit to FEMA (FEMA map revision applications must be submitted by the participating local agency). Construction of the preferred replacement bridge commenced shortly after timely FEMA approval of the CLOMR. After the bridge was completed PHI prepared a LOMR application reflecting minor differences between the project as designed and as constructed. The LOMR was approved in a timely manner.